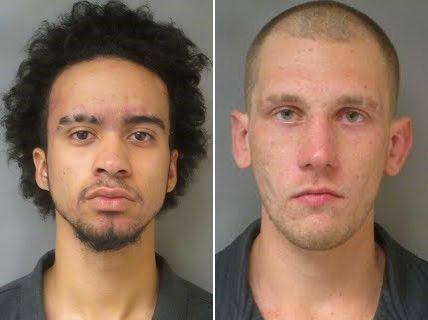 Two Lebanon men and a juvenile were arrested on robbery and drug charges after robbing a man of his cell phone. Lebanon Police say at approximately 1:20 AM, Lebanon Officers responded to the area of Taylor Street for a reported Robbery. The victim told officers that he had been walking on Taylor Street when he was approached by three males who stole his cell phone and headphones while threatening to kill him and his family. Based on the physical description provided by the victim, officers made contact with two male subjects at a residence on Elm Street. After a brief investigation, officers discovered that a third male had fled the residence as they were arriving. Officers further determined that the male subject who had fled was the subject who had threatened the victim and robbed him of his property. Officers sought and were granted a search warrant for the residence where the initial two male subjects were found. As a result of the search, officers located the victim’s headphones and the SIM card from his cell phone at the residence. The area was searched and the third subject believed to be involved, a 15-year-old juvenile, was located. He was found to have an active Juvenile Detention Order from the Manchester Police Department. He was taken into custody and found to be in possession of the victim’s cell phone. Antonio Callaghan, age 18, of Elm Street in Lebanon was arrested and charged with Conspiracy to Commit Robbery, a Class B Felony. He was also charged with Unlawful Possession of Alcohol, a Violation, and Possession of a Controlled Drug, a Class A Misdemeanor. He was held in lieu of $20,000 cash bail and transported to the Grafton County House of Corrections to await arraignment on September 22, 2016. Justin Cohn, age 22, of Elm Street in Lebanon was also arrested and charged with Conspiracy to Commit Robbery, a Class B Felony. He was also charged with Prohibited Sales of Alcohol, a Class B Misdemeanor, and Possession of a Controlled Drug, a Class A Misdemeanor. He was held in lieu of $10,000 cash bail and transported to the Grafton County House of Corrections to await arraignment on September 22, 2016. The 15-year-old juvenile was transported to a Juvenile Detention Facility to await further juvenile proceedings where he is expected to face Robbery charges.